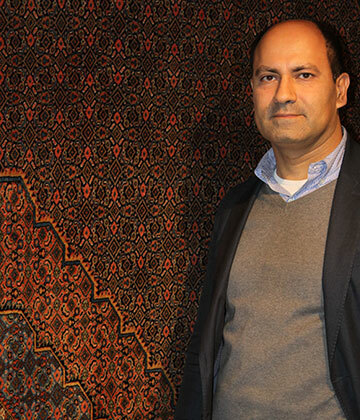 Iranian Carpet Co is based in Belgium since 1975. Founded by Mr. Reza Aminian, who has over 45 years experience in the trade of hand-knotted carpets in bazaars of Iran and throughout Europe, this family business has been taken over by Mr. Ali Aminian in the year 2000. Our collection consists of carpet from different origins, which you can see in our webshop. Some patterns are floral, other geometric. The node density per m2 is also important and stands for superior quality. We travel through different countries to make a careful selection of the finest oriental carpets from Iran, but also from Afghanistan, Turkey and the Caucasus. Our regular contact with various suppliers from these countries guarantees you the best possible price/quality. We offer a home service which allows you view carpets at your home and to get our personal assistance choosing the best style & size. We provide guarantee and maintenance of your oriental carpets and our services include cleaning and repairing (fringes, edges, rips…). Our company is also certified to perform carpet expertises (for instance after a natural disaster) thanks to our close collaboration with large insurance companies. Our services include the sales of Persian rugs, as well as the restoration and cleaning of rugs. Discover our collection of hand-knotted Persian rugs & kilims in our webstore and in our showroom. We welcome you in our showroom located in Wezembeek-Oppem, within a 10 minutes drive from the center of Brussels.